If your organization has enthusiasm and land available in the city of Boston, then consider applying for the Grow Boston Greener grants to get money for planting trees. This is an especially great opportunity for our Boston Delegations who want to expand their fruit tree plantings to create a true community orchard! These competitive mini-grants provide anywhere from $500-$2,500 to non-profit organizations who will plant trees on public property (or publicly-accessible private land) in any neighborhood of Boston. The Grow Boston Greener vision is to increase the urban tree canopy to 35% and make Boston a cooler, greener, healthier city. 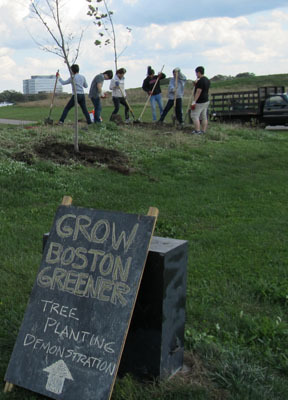 Like the Boston Tree Party, Grow Boston Greener focuses not only on planting trees, but also on the community-based stewardship activities necessary to ensure the trees’ survival. Therefore, priority is given to applicants who can demonstrate an ability to organize residents to maintain the newly planted trees for years to come. The application deadline for the grant is October 10, 2012. Visit www.growbostongreener.org for more infomation. And good luck to anyone who applies! «« PREVIOUS: Boston Urban Forest Council: Invasives and Grants!